Abstract: Undiagnosed or persistent Helicobacter pylori infection and surreptitious or unrecognized NSAID use are the most common causes of refractory peptic ulcers. The use of antibiotics, bismuth, or proton pump inhibitors (PPIs) suppresses the H pylori bacterial load and may obscure the diagnosis. H pylori infections have also become more difficult to cure because of increased antibiotic resistance. For refractory infection, select an antibiotic based on in vitro susceptibility testing. When this is not available, combination therapy with a PPI, tetracycline, metronidazole, and bismuth is often effective. 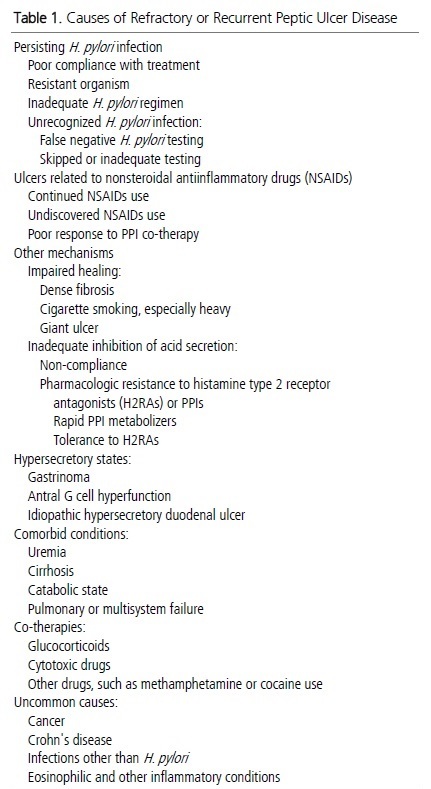 To detect surreptitious or inadvertent NSAID use, review the drug history in detail. When there is any doubt about such use, check platelet cyclooxygenase function. DM, gout, rheumatoid arthritis, celecoxib와 prednisolone 등 복용 중. 수년 동안 모양이 거의 비슷하였음. 신장이식 환자. 방광암 치료 받음. 불응성 궤양이었고 조직검사에서 CMV가 나왔음. Ganciclovir 효과가 명확하지 않았고 PPI 사용하고 있음. 6-12 개월 간격의 내시경 검사에서 PPI 사용했음에도 불구하고 궤양 지속됨.